At this time deputies say Shalvinesh Sharma's cause of death is unknown, but in late March, family members told ABC10 that they believed Sharma and his wife Roselyn were the victims of a crash off Highway 50. The body of a Sacramento man was recovered from the Sacramento River Thursday, according to the Yolo County Sheriff's Department. Deputies say Shalvinesh Sharma was pulled from the water just before 11 a.m.
Sharma's body was discovered after calls came in reporting that a body was floating in the Sacramento River around 8:45 a.m. Two hours later he was recovered from the river, just south of Garcia Bend, according to the West Sacramento Fire Department. The Yolo County Coroner has not yet determined Sharma's cause of death, but in late March, family members told ABC10 that they believed Sharma and his wife Roselyn were the victims of a crash off Highway 50. There is no update on where Roselyn may be. The crash happened around 10:30 p.m. on Tuesday, March 26. What was described as a white flatbed tow truck plunged into the water after a two-car crash along the Pioneer Bridge, according to the South Sacramento CHP. The Sacramento Drowning Accident Rescue Team [DART] searched the river but was unable to find anyone after the crash. Five days later rescue crews found a vehicle 35 feet below the Sacramento River at Highway 50's Pioneer Bridge. They said it may be the tow truck that fell into the river, but they were unable to pull the vehicle from the river. 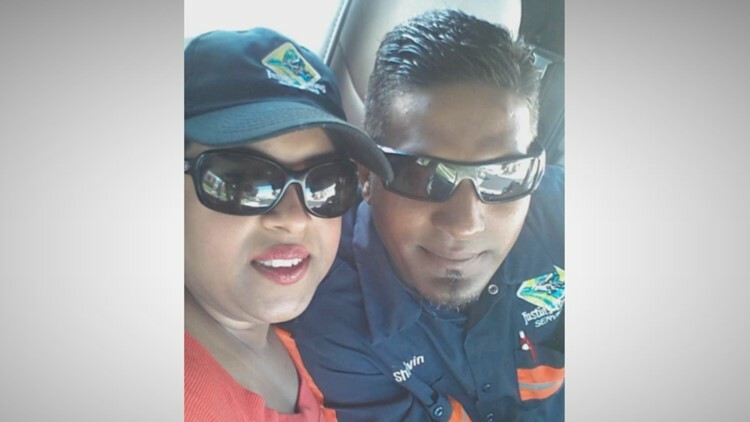 Days before, family members and friends of Shalvinesh and Roselyn Sharma began to hold vigils for the missing couple, telling ABC10 that the couple owned Justin's Towing Services. "They built this company for their kids. Everything was for their kids," Johnson said. "They wanted a future for their kids. They didn't want them to have to struggle. They were excellent, they were always together as a family." At this time authorities have not been able to recover the tow truck involved in the crash near Pioneer Bridge and have not confirmed that the Sharmas were in the tow truck when it crashed. South Sacramento CHP announced that family members were able to gain power of attorney over Justin's Towing and were working with Global Diving and Salvage to recover the vehicle from the river. "Global Diving and Salvage plans on transporting a barge with the necessary equipment to make a recovery of the vehicle from their Bay Area headquarters," CHP said on their Facebook page. "Recovery efforts of the vehicle are expected to begin Friday." Anyone with information about the body recovery in the Sacramento River is asked to contact dispatch at (530)666-8282. Anonymous tips can be reported at (530)668-5248.